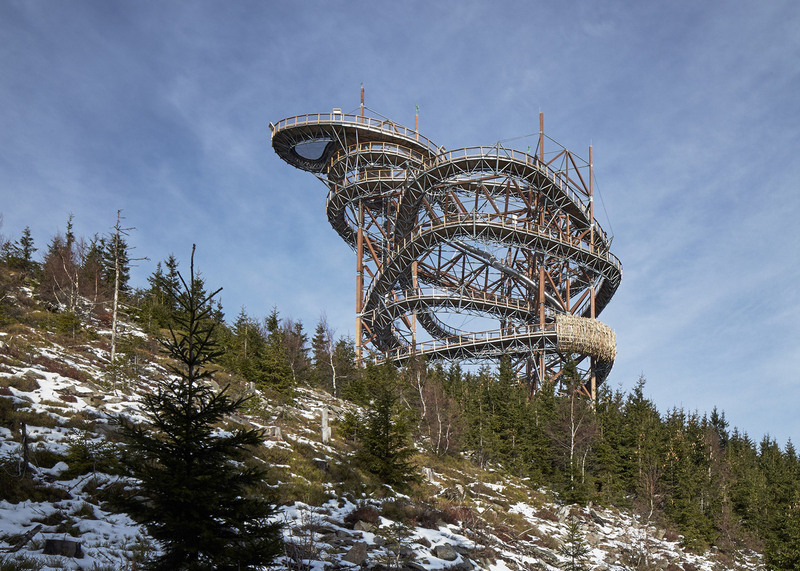 A 101-metre slide winds down through this coiling structure by Fránek Architects, perched on a mountain in the Czech Republic (+ slideshow). 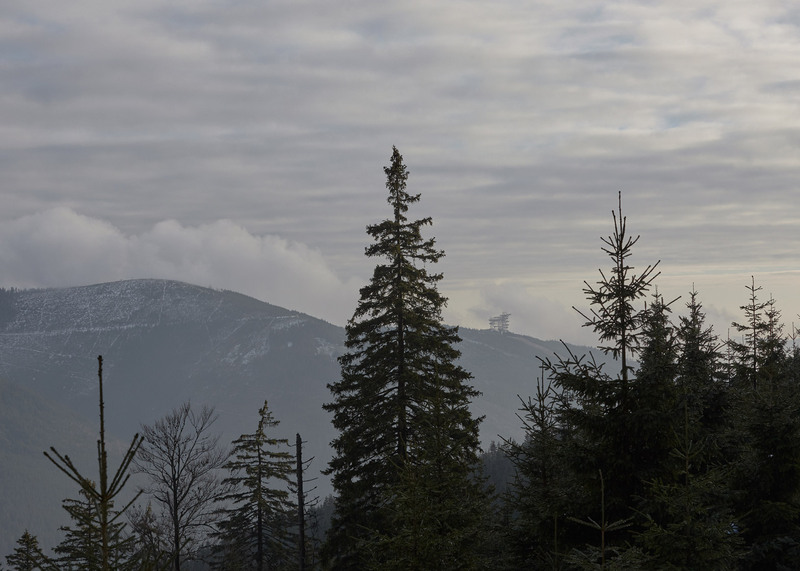 The Sky Walk is situated 1,116 metres above sea level, at the top of a chair lift near the village of Dolni Morava. Brno-based Fránek Architects worked with Czech construction company Taros Nova to build the wood and steel structure, which took six months to complete. 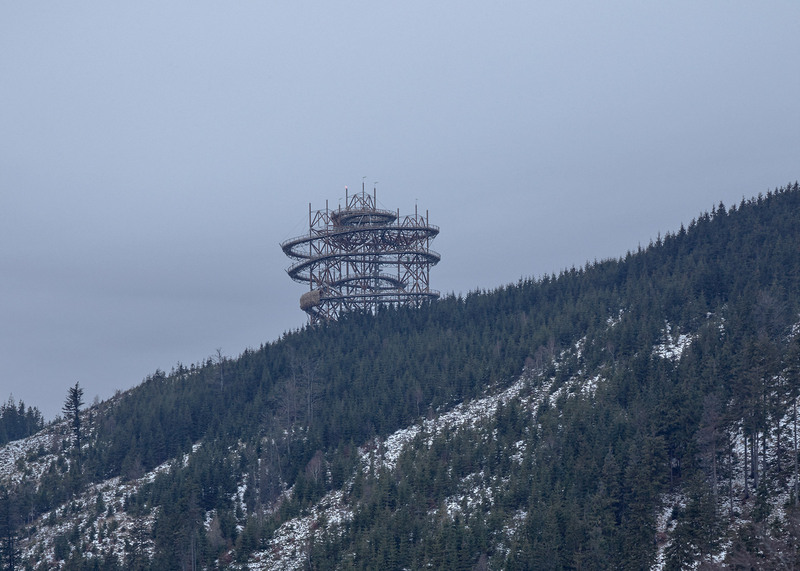 "It is rare to use timber on a construction of this magnitude," said studio founder Zdeněk Fránek. "It also creates a new kind of experience where people better realise how small they are in the bosom of nature." It forms a path that gently ramps up in an irregular spiral to a viewing platform at the top, while a slide for "more adventurous visitors" provides a faster route down. The stainless steel tube curves through the centre, with windows along its length so sliders feel less claustrophobic. A similar slide is proposed for Anish Kapoor's ArcelorMittal Orbit sculpture in London's Queen Elizabeth Olympic Park. At the top of the Sky Walk, a loop in the path that extends beyond the main structure is filled in with a net. Visitors can lie on top of the netting for vertigo-inducing view of the forest below. Covered with wooden planks and supported by a steel truss, the walkway is inclined to accommodate pushchairs and wheelchairs. Hand railings along its length have wire mesh sides. A metal spiral staircase is also included to provide an emergency escape route. The structure was designed to resist the extreme weather conditions of the exposed site. Concrete foundations anchor the vertical elements into the ground, while cross bracing and thin cables provides extra rigidity. Huge wooden elements are joined with steel connectors to create trusses that are triangular in cross section. Used both horizontally, these create a frame around which the walkway is built. "I don't know of any other timber construction with steel elements of a similar size and purpose," Fránek said. "There are constructions of a similar size but ours takes on an abstract form that suggests the flight of a nocturnal butterfly whose path is seemingly chaotic." 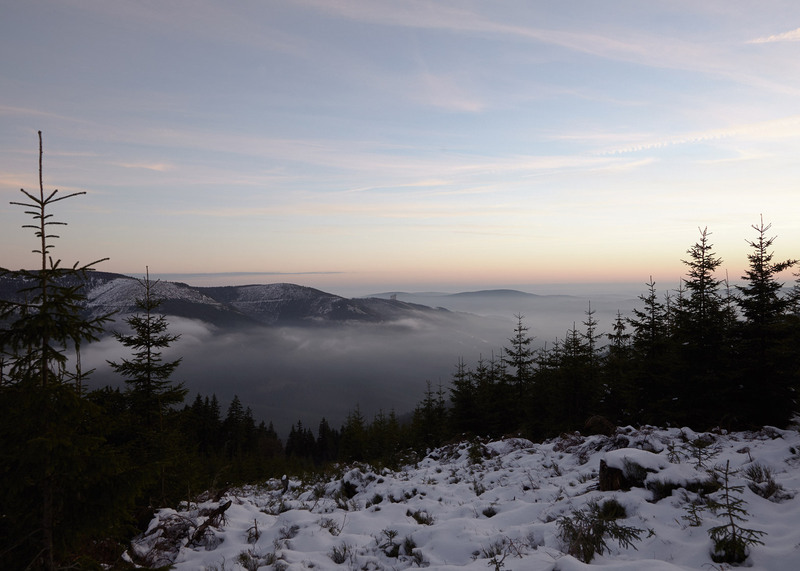 From the top, visitors can take in panoramic views of the Králický Sněžník massif and the Morava river. 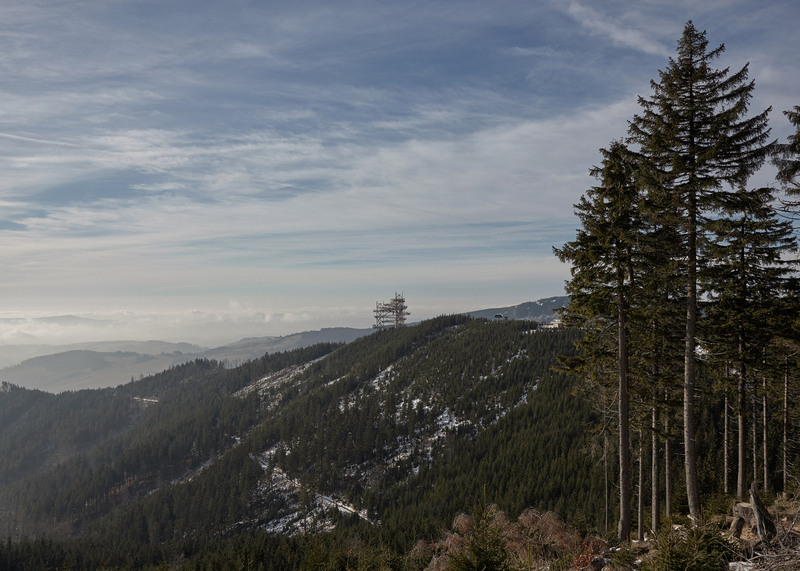 "It offers an endless amount of views, situations and moments where an indiscernible human being enters the depth and emerges on the outskirts of this natural structure," said Fránek. To make the most of mountain-top vistas, other architects have created viewpoints that include a wooden structure above a three-kilometre-wide lake and a spiral lookout point for a pilgrimage route near Guadalajara.